Seattle Refined: "The Most Unique New Neighborhood in Seattle"
More than a century in the making, the opportunity to own one of the last Colonial Revival estates within Seattle’s historic Fort Lawton arrives this weekend. Just listed on Officer’s Row is a Prosch Plan at 4218 Washington Avenue, which is available for immediate occupancy at $2.1 million. This nostalgic home offers 4,088 square feet of living space comprising four bedrooms and three and a half bathrooms and is built upon a large 27,303 square feet lot with a new two-car, detached garage. Originally built between 1899 and 1904 as housing for military officers, each home is expansively restored with modern conveniences while honoring their historic past. 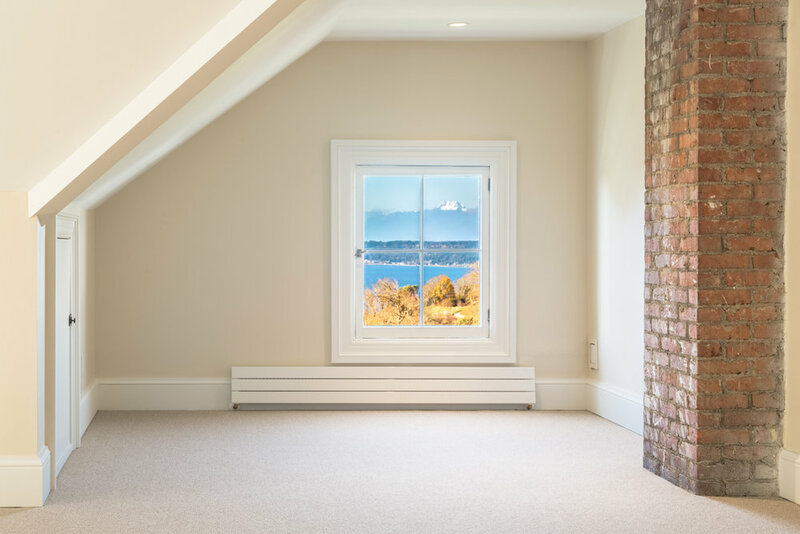 Proudly perched over the former Parade Grounds, the homes at Officer’s Row provide unobstructed views of open natural landscape, Puget Sound, and the Olympic Mountains. This natural sanctuary remains just 15 minutes from downtown Seattle, offering its residents the best of both worlds. Discovery Park is recognized as one of Seattle’s signature naturalized parks; offering hiking trails and running trails, protected tidal beaches and meadow lands, sea cliffs and sand dunes. An unprecedented series of events taken place over the past century that has led to these landmark homes to be surrounded by hundreds of acres of parkland – effectively an island of fee-simple land and private residences now offered for individual ownership. This final phase follows an earlier release at Montana Circle – a collection of thirteen homes ranging in size from 1,675 to 1,995 square feet, which closed between $800,000 and $1.2 million. The Homes at Officer’s Row are considerably larger, including the General’s house of 6,656 square foot which went pending earlier this week for $3.75 million. In addition to the Prosch Plan, McMahon has also listed a larger home at 4010 Washington Avenue. Known as the Ellicott Plan, this six bedroom and four and a half bathroom estate comprises 6,278 square feet on a 15,623 square foot lot and is offered for $2.9 million. 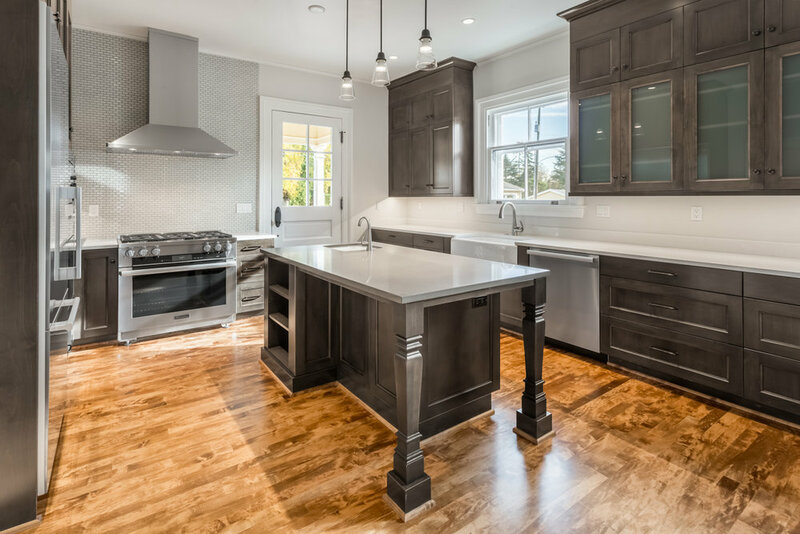 The developer, RISE Properties artfully curated the Homes at Fort Lawton along with Seattle-based GGLO. The award-winning design team worked with The Landmarks Preservation Board to restore the nostalgic architecture with new roofs, seismic updates and serene landscaping and hardscapes. Shared common areas include a community pea-patch and vegetable garden, a fire pit and two playgrounds for children within the neighborhood. 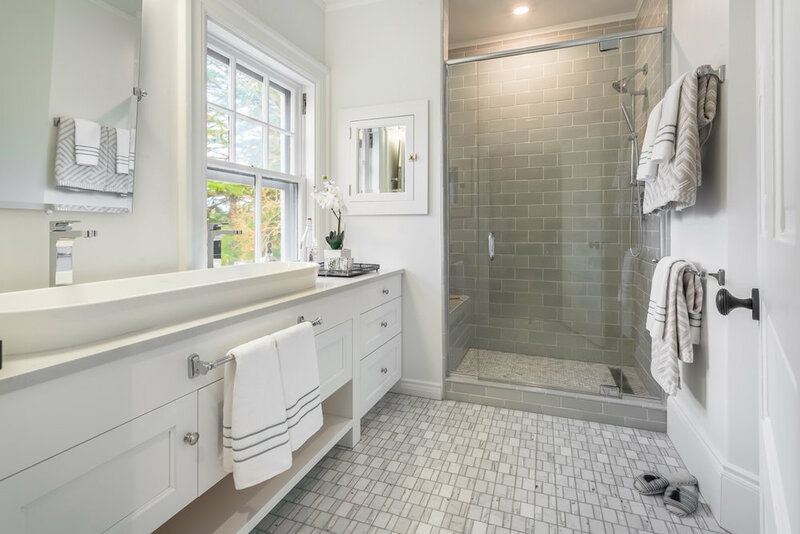 Inside features include all-new plumbing and electrical systems with hydronic heating on the main floor and low-profile radiators on other levels. The kitchens boast new cabinets, quartz countertops and a full appointment of premium Miele appliances with gas cooking. Creative reworking of upper level floor plans produced gracious bedrooms, spa-like bathrooms and even walk-in closets – just a few of the many updates that bring these historic homes into modern day living. 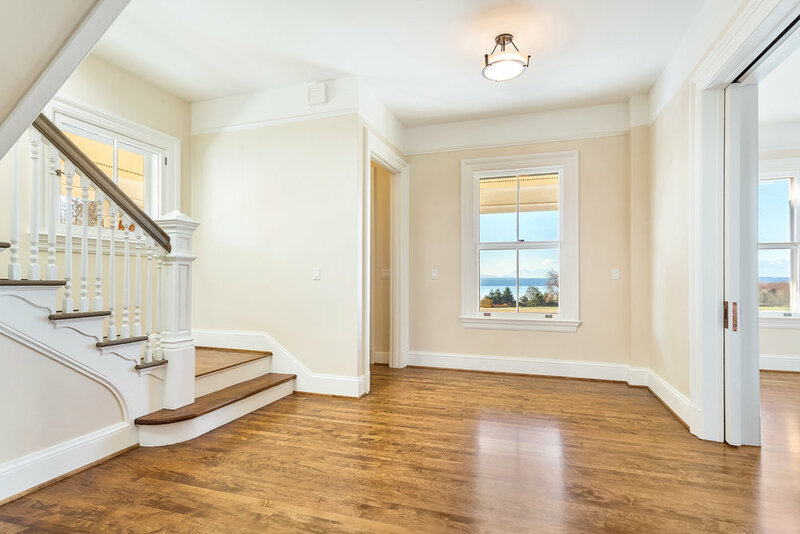 Home owners will appreciate refinished hardwood floors, broad moldings and unique features that are honored throughout each residence. A fully-finished daylight basement is framed by thick stone walls and exposed brickwork while a fourth story provides a loft area perfect for a media room, bedroom suite or a private home office. Oversized windows flood each home with light while mature landscaping ensures privacy and serene environment – a scene straight out of an early period novel. While the opportunity to live in a national treasure will be admired by many, Fort Lawton will become home to only a fortunate few. Resales may be possible but McMahon believes most will become family heirlooms passed down to future generations. A new app called Explore Discovery Park can be downloaded on the Fort Lawton website that encourages self-guided, walking tours of the historic monuments and attractions of the park. This article is featured in The Seattle Times: "Historic home in Discovery Park offered for sale"
VIEW THESE HOMES: A Sales Gallery and furnished home are available for qualified homebuyer tours by appointment only – contact Stephanie McMahon at 206.595.3885 or visit www.OwnFortLawton.com for more information. The Last Of Fort Lawton's "Grand Dames"
With the pending sales of the General’s House, one of the two Ellicott plans, the opportunity to own one of Fort Lawton’s largest estates is now limited. 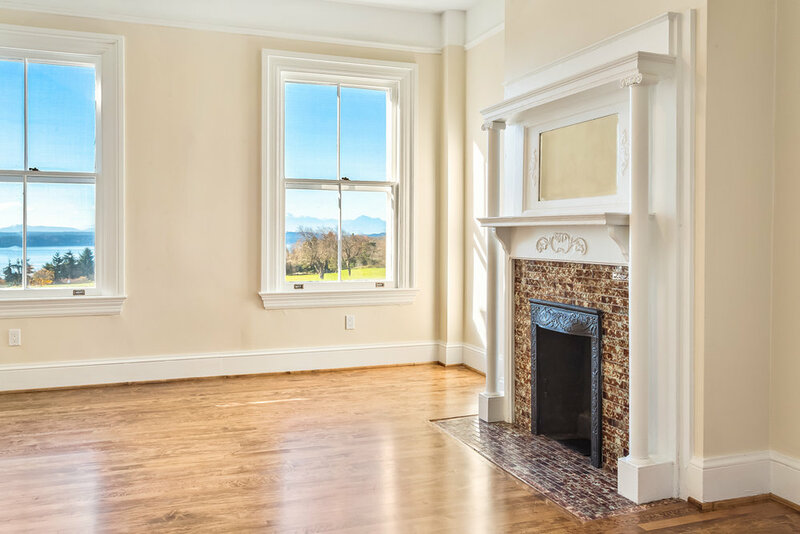 Located at 4010 Washington Avenue West (in Discovery Park), the Ellicott is carefully sited upon a 15,623 square foot, fee-simple lot overlooking the historic Parade Grounds and Puget Sound, just as it has for more than a century. The home plan is named after Anna Ellicott, one of Seattle’s early pioneers, whose land donation contributed to the formation of Fort Lawton in 1900. The Ellicott comprises 6,278 sqare feet of living space, featuring six bedrooms and four and a half bathrooms. Originally built in 1904, the Ellicott is one of only thirteen homes to be released for sale on Officer’s Row. It was a former residence for many of the military’s most senior officers until Fort Lawton was closed in 1973. Much of what was once Fort Lawton was donated to the City of Seattle and became Discovery Park – a 534-acre sanctuary just fifteen minutes from downtown Seattle. Excluded from the public donation is the 9-acres of land surrounding the two residential communities known as Montana Circle and Officer’s Row. Blakeslee has a personal perspective after spending the summer of 2015 on Officer’s Row with his family before the restoration efforts took place. He describes coming home to Discovery Park like enjoying a whole new day at the end of the day. Blakeslee retained Seattle’s renowned architectural firm GGLO to lead the restoration plan and the team worked with the Landmarks Preservation Board to make exterior improvements such as seismic upgrades, new roofs, new paint (matching historical records) and extensive landscaping. The proud Colonial Revival architecture harkens back to other US treasures such as Monticello and Mount Vernon, and is the defining design element of the Fort Lawton Historic District. While this district remains a protected national landmark, RISE was able to add two car garages for each home on Officer’s Row. GGLO also designed exclusive common areas offering residents access to a shared pea-patch, children’s playgrounds and a neighborhood fire pit for community gatherings. On the inside each home was thoughtfully restored, preserving the nostalgic character, historic millwork and refinished hardwood floors, but otherwise RISE wanted these homes to live like new properties. New residents will enjoy all-new plumbing, electrical and mechanical systems, including hydronic in-floor heat on the main floor and electric heated marble floors in the bathrooms, while new, low-profile radiators heat the other rooms. The kitchen was completely transformed from a utility into a generously-scaled and bright gathering space complete with executive-quality Miele appliances, including a wine fridge, gas cooking, and two ovens. GGLO also reprioritized living spaces on the upper level to include a larger spa-style master bathroom retreat and walk-in closets. The top floor and daylight basement were also reimagined and fully finished for modern living. As if living in Discovery Park isn’t already enough benefit, the preserved homes qualify for a property tax credit for the next ten years, which means owners can save thousands of dollars per year. The Ellicott is among the final offerings in what’s been an extraordinary sales program at Fort Lawton. In 2015, RISE began restoration and quickly sold all thirteen homes that comprise Montana Circle. Earlier this year several Prosch plans, a 4,000 sq. ft. version of Officer’s Row homes were also sold and closed. From the low $2 millions. The two final Prosch plans located at 4216 and 4218 Washington Avenue West are anticipated to be listed next week upon completion of their restoration. Prospective homebuyers interesting in viewing the home this weekend from 11am to 5pm are encouraged to register online at www.OwnFortLawton.com. Today – October 26th, 2016 - we had an unfortunate fire at one of the empty, unoccupied homes. The home is located on the north side of Officer’s Row, which includes 7-homes all of which are still under renovation. On Wednesday April 27, the Homes at Fort Lawton team hosted the first of many exclusive members-only Officer's Club events! Located at the GGLO design offices, prospective buyers got the chance to view the official design palette and restoration process of the homes soon-to-be-released at Officer's Row. On April 26th, Officer's Club members will gather in an intimate environment to converse with the interior design and development team, review and compare floorplans, and examine finishes and appliances while they eat, sip and ask questions. A press release from April 12th describes the recent sale of all thirteen homes at Montana Circle. The announcement was met with significant local media attention, as features in The Puget Sound Business Journal, the Daily Journal of Commerceand Curbed Seattle soon followed. In preparation for the summer sales debut, RISE Properties introduces the "Officer's Club"-a tailored program for qualified homebuyers (and their brokers) to receive priority sales information, gain preferred access to private events on an invitation-only basis, and participate in the Officer's Row reservation process. LIKE NO OTHER. The much anticipated Kierstedt Plan at 4415 Montana Circle is now released for immediate sale and offered at $1,099,000. The One and Only Single-Family Residence at Fort Lawton Coming to Market! The Homes at Montana Circle are nearly sold out! We are pleased to report we are now pending, closed or reserved on all but one final home at Montana Circle – the much anticipated Kierstedt Plan. 9 of 13 homes sold since October! Grab a cup of coffee this weekend and take a look at the Homes at Fort Lawton featured in the Seattle Times NW Homes section! Fort Lawton's Montana Circle is nearly sold out! Curbed Seattle was excited to finally get a peek inside these heirloom homes before they are all sold! Sotheby’s International Realty Affiliates released the Fourth Volume of Collections for 2015, which features Realogics Sotheby’s International Realty (RSIR) for their representation of the Historic Homes at Fort Lawton. Just days following the announcement in The Seattle Times that presales would be accepted on additional homes at Montana Circle, the sales team at Fort Lawton reports that 9 of 13 homes have found new owners. Three homes remain available, including two Jenott Plans at 4410 and 4412 Montana Circle. Grab a cup of coffee and take a peek at Fort Lawton featured in the Seattle Times NW Homes section from this weekend! Touting the sales and highly sought-after remaining homes, the Times highlights the new-found community experience that the Homes at Fort Lawton are fostering. The first official sale at the Homes at Fort Lawton has closed and the Seattle Times announced the momentous occasion! The 1,994 square foot brick home sold for over the asking price, at $1.05 million.